Rivers and streams that flow through cities and towns are inevitably polluted and ultimately mirror the societal and industrial activities within the catchment. 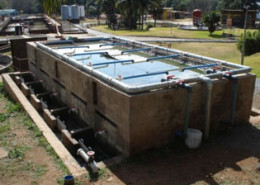 A wide range of waste sources contribute to the deterioration of water quality, from informal settlements, malfunctioning sewers, solid waste transported by rainwater runoff and illegal industrial discharges to storm water systems. Formal infrastructure systems, however important, have become incapable of protecting surface water quality downstream of human settlements. The solutions to maintain healthy urban rivers can be found in the transition from classical services orientated planning towards water sensitive urban design. This comes with the acknowledgement that management of rain water runoff and stormwater systems is just as much a question of water quality as it is a matter of hydraulics.